The Cardio Fitness T3 treadmill is designed with form and functionality in mind. From its sleek aesthetic curves that complement any home environment, to patented features that provide comfort and control, the T3 Treadmill is everything you expect from Life Fitness. Pair it with the Advanced Workouts Console for added workout variety and advanced programs to better help you reach your fitness goals. Customize your equipment by selecting the console that best fits your needs. Choose from the Advanced Workouts Console or Basic Workouts Console. Both incorporate the latest technology and sleek designs. ToughTrain 3.5 out of 5 If looking for heavy exercise, despite of its overprice, it can be a better choice. 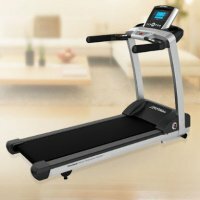 *Note: Most of the sites, stores or shopping portals listed above sell Cardio Fitness T3 Advance Console Treadmill with discounts and other exciting offers. There is a possibility that the some of above websites are not selling Cardio Fitness T3 Advance Console Treadmill now. Toughtrain.com is not liable for such cases or instances. Also we do not recommend any seller for Cardio Fitness T3 Advance Console Treadmill and a buyer should buy from where he/she gets best deal with quality of products, service and on time delivery (shipment).